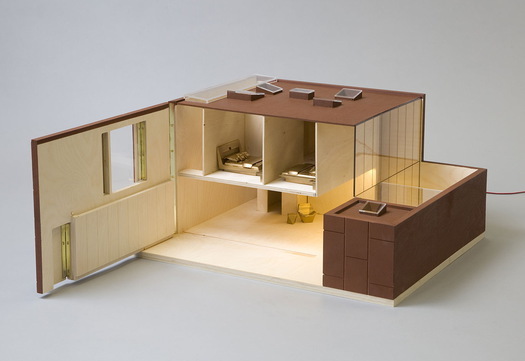 All the KIDS Dollhouses are "designed to include at least one feature that makes life easier for a child with a disability." Let's see what's on offer! 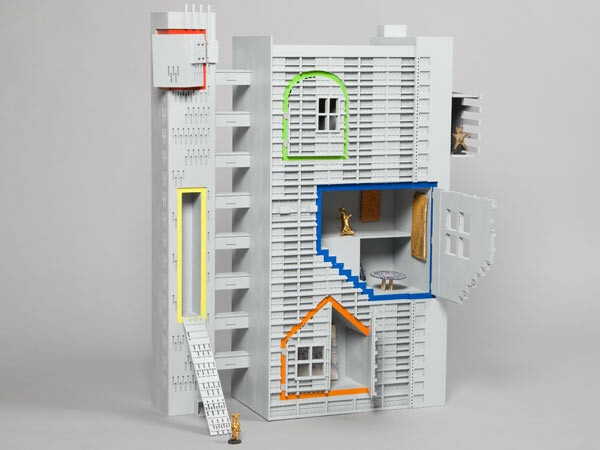 David Adjaye and Chris Ofili's "Electra House" [above] has a continuous ground level that is "accessible to all." 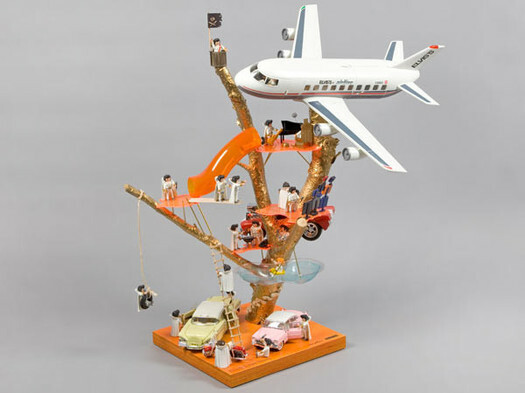 AModels has built "Elvis's Tree House" at Playmobil scale, based on an actual playground in Southampton. 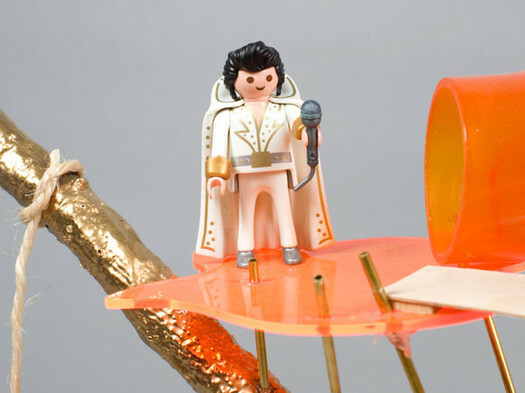 It is populated entirely by Playmobil Elvises, including one sitting in the lavatory on the Playmobil plane, which is, presumably, wheelchair-accessible. Easily seven out of the 20 dollhouses use the stacked block tower concept to create what amount to dollskycrapers. The giant apartment block designed by Lifschutz Davidson Sandilands is representative, and has the benefit of actually seeming playable. 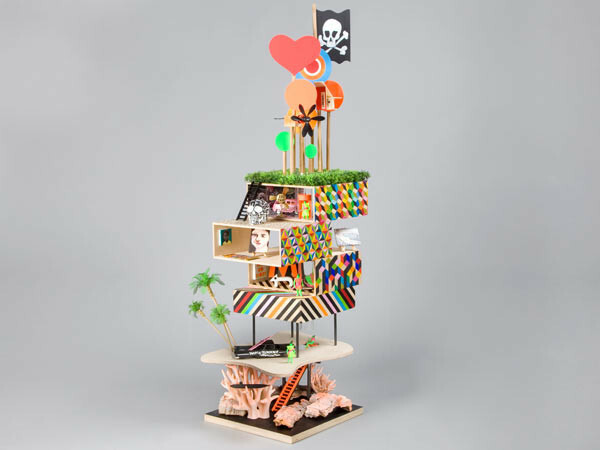 Morag Myerscough and Luke Morgan's tower is more fantastical, based as it is on a Shel Silverstein-esque poem about "a house on a coral in the deep blue sea." Which sounds to me like a reference to the early 20th century South Pacific explorer Beatrice Grimshaw. 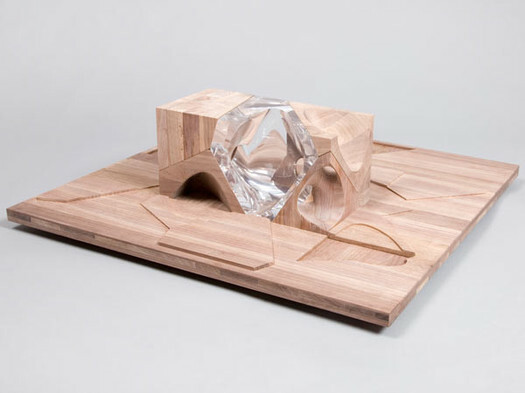 Zaha Hadid, bless her heart, has made an amazing sculptural object of a dollhouse out of ardwood and cast acrylic that is an interpretation of a 2007 project, the Ideal House. 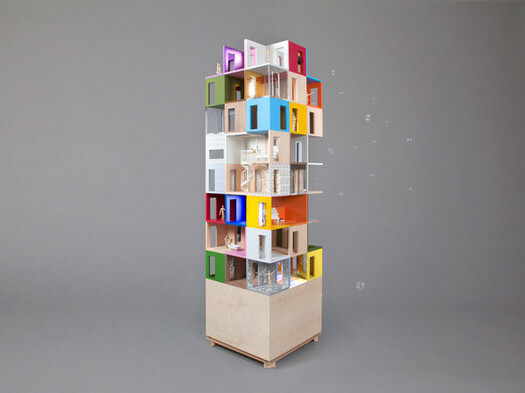 It can be reconfigured like a puzzle, and I assume that its accessibility feature is that its spaces are equally inhospitable to dolls of all physical abilities. 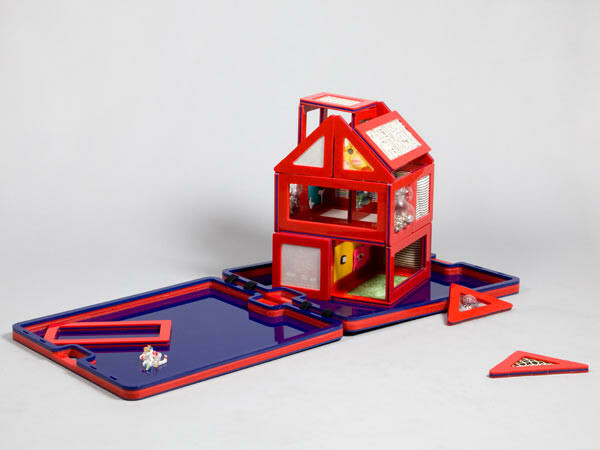 MAE and MAKlab created this also-reconfigurable flatpack dollhouse that looks like a more structurally sound set of Magna-Tiles. It's an interesting idea that could be developed into an actual product. 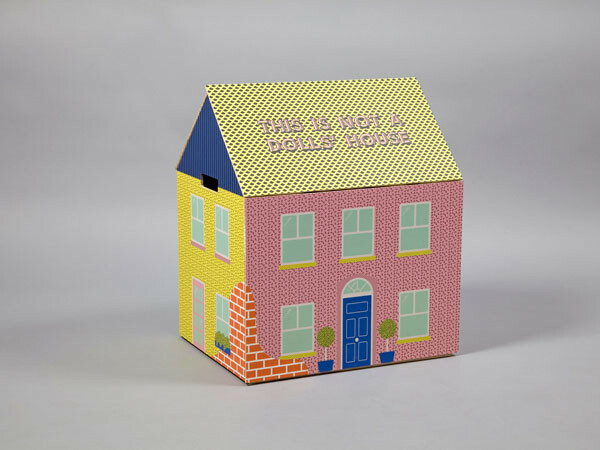 Working with Turner Prize-winning, cross-dressing potter and art lecturer extraordinaire Grayson Perry, FAT Architects has created Tower of Fable, a kid-sized version of Balfron Tower, Erno Goldfinger's stark modernist landmark, with a whimsical doll cottage inside. And the absolute winner of everything, and the dollhouse that should raise 100,000 pounds on its own, just for sheer awesomeness, is by Guy Howells. 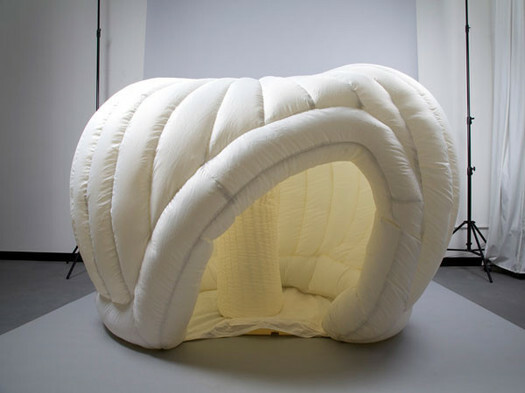 It's called Jack in the Box, and the kid opens the roof, which turns on a fan, and the walls fall down, and a giant, inflatable room. 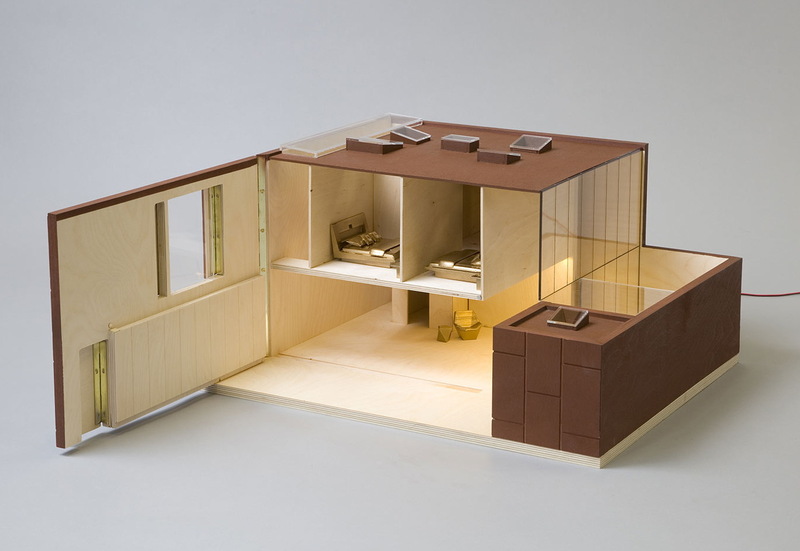 The dollhouse you can actually get into, which, after all, is the entire point.